Thomas A. Prendergast and Barbara Kline, eds. This collection of original essays examines how the idea of an authentic Chaucerian text was reimagined and reproduced by medieval and early modern scribes and editors to satisfy and shape the cultural expectations of their audiences. These “reproductions” of Chaucer’s works epitomize the tension between developing notions of what makes a text “authentic” and the cultural pressures that led scribes and editors to construct their own versions of Chaucer and his works. The book begins by exploring medieval and early modern notions of origins and how they at once illuminate and problematize the recovery of Chaucerian texts. Essays in the second section examine how individual scribes and reading communities reshaped Chaucer’s texts. Finally, we see how the printing press— bringing with it a renewed concern about the idea of authenticity—led at once to an increase in the number of works attributed to Chaucer and to increasing anxiety about their authenticity. The focus on the ways in which Chaucer was rewritten in different cultural and aesthetic contexts will enable medieval and early modern critics to situate Chaucer more fully within his cultural milieu, while illuminating the ways in which his reputation as both a “laureate poet” and a “lewed compilator” affected rewritings of his works. 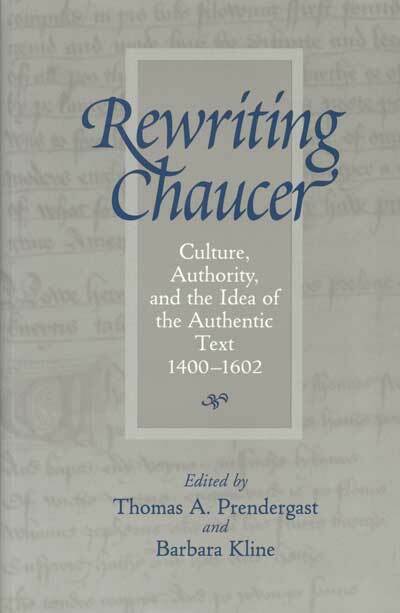 Rewriting Chaucer, then, will appeal both to scholars interested in the critical juncture between manuscript and print culture and to those interested in how culture affects the reproduction of authoritative texts. Thomas A. Prendergast is an assistant professor of English at the College of Wooster. Barbara Kline has taught at Florida International University and at Albertson College as an assistant professor of English. 352 pp. 6 x 9 3 illus.